One of the primary reasons people choose to live in gated communities is the extra safety they afford. But what about when your own residents disrupt that safety? Drivers that speed on your roads disturb the calm, peaceful environment and make roads dangerous for children, pets, pedestrians, and cyclists. 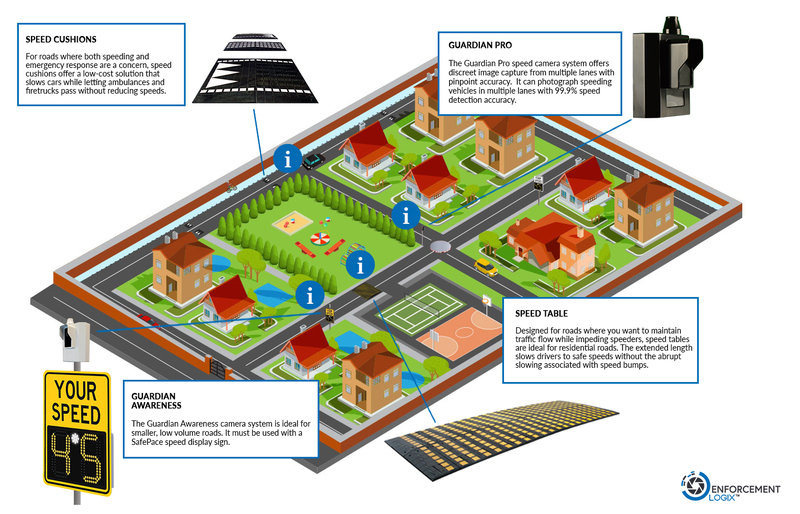 Speed cameras for gated communities can help restore safety to your streets. Speed camera enforcement is a proven technique to slow cars down and keep them driving at safe speeds. The Guardian speed camera system includes a discreet speed detection camera used as an accessory to any of the SafePace “your speed” signs. Drivers see their speed displayed on the SafePace radar sign. The sign then alerts speeders to slow down. Any car that doesn’t slow down and adhere to the speed threshold you set has their license plate photographed by the Guardian Camera. Photos are automatically uploaded to the cloud. You can access violator data from anywhere, anytime. Issue a warning or impose a fine and enforce posted speed limits. Your residents deserve safe roads. Our speed cameras for private communities such as the Guardian speed camera system can help achieve that.